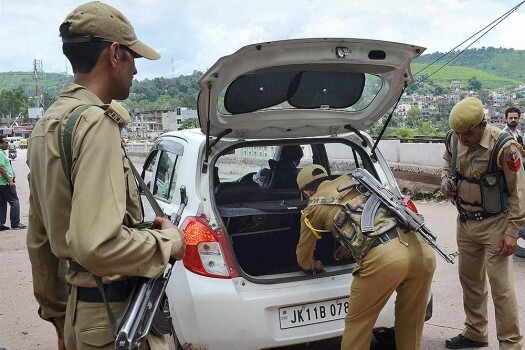 Security personnel check a vehicle at Jammu-Poonch national highway near Rajouri in the wake of terrorist attack on Sunjuwan Military Station. 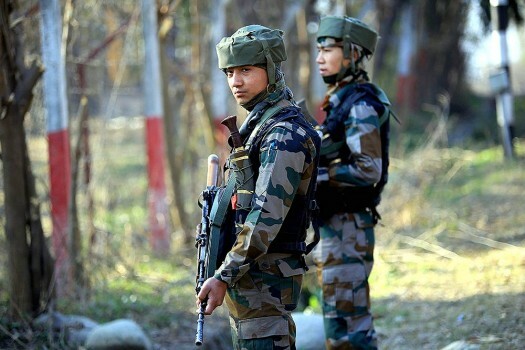 Army soldiers stand guard near the line of control at Rajouri in Nowshera sector of Jammu. 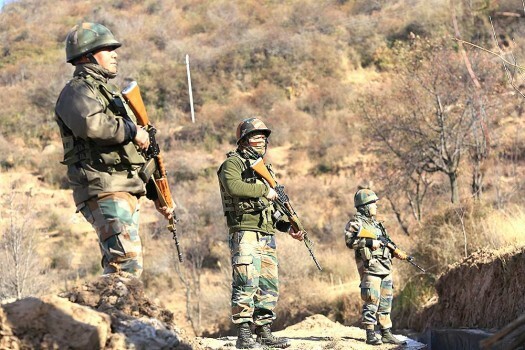 Army jawans take positions along LoC in Rajouri, a day after Pakistan attacked Indian posts with anti-tank missiles. Jammu and Kashmir Chief Minister Mehbooba Mufti during her visit at Shahdra-Sharief Shrine in Rajouri District in Jammu and Kashmir. 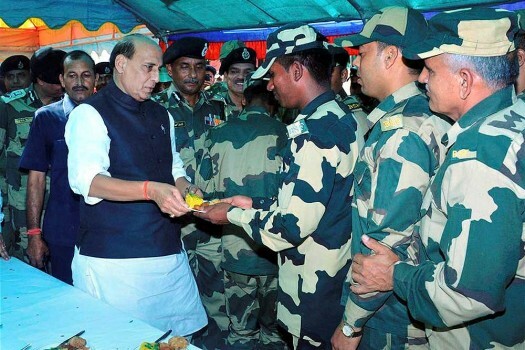 Union Home Minister Rajnath Singh during a visit to BSF Campus in the Nowshera sector of Rajouri district. 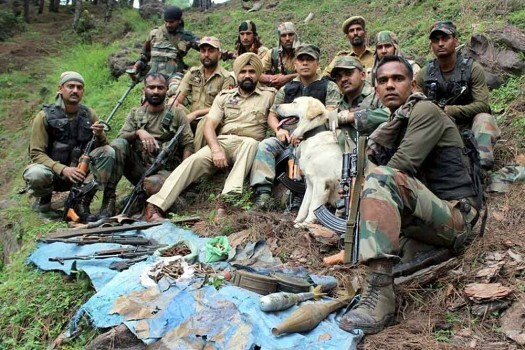 Army and Jammu and Kashmir Police men showing a huge cache of arms and ammunition, including two AK assault rifles and explosives, seized during a joint operation in Rajouri. 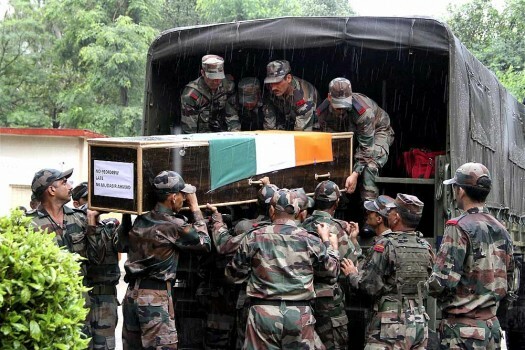 Army jawans carry coffin of Naik Muddasar Ahmed at a ceremony in Jammu. 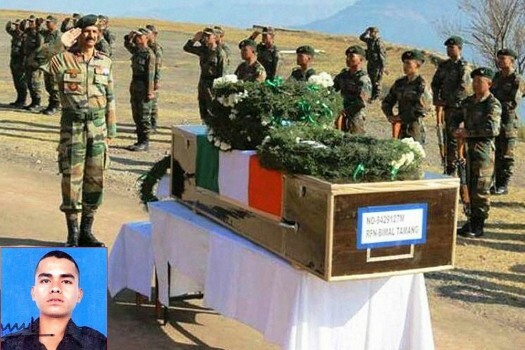 Muddasar Ahmed lost his life in a ceasefire violation by Pakistan in Rajouri. 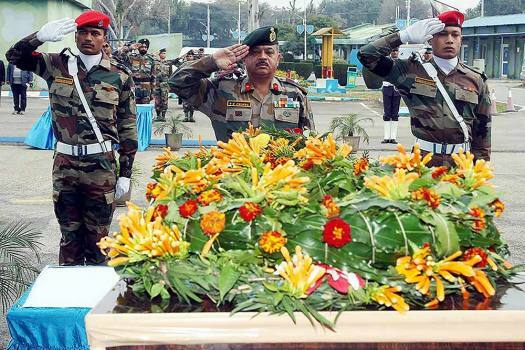 Indian Army officers paying tribute during laying of wreath ceremony for Naik Muddasar Ahmed in Jammu. Muddasar Ahmed lost his life in a ceasefire violation by Pakistan in Rajouri. 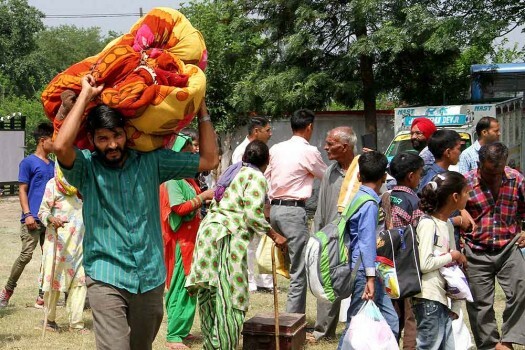 Border migrants of Jhanghar village take shelter in government school after shelling from Pakistan side at Nowshera sector of Rajouri district. 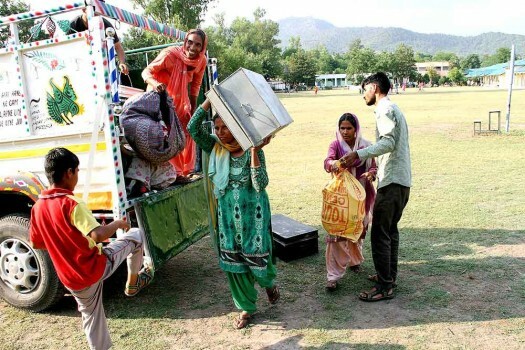 Border migrants arrive to take shelter in government school after shelling from Pakistan side at Nowshera sector of Rajouri district. People take shelter in a bunker near their residence at Bhawani village, Nowshera sector, along the Line of Control in Jammu & Kashmir. 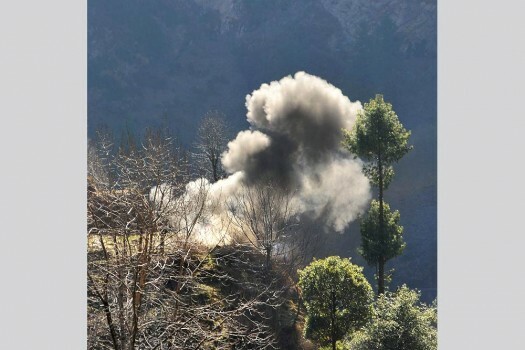 Smoke billows out after a mortar shell was allegedly fired by Pakistani Army near the Line of Control (LoC) in Rajouri district, J & K.
A militant hideout was busted in a joint operation launched by the army and the J&K Police at Tattapani forests in Kalakote belt, in Rajouri. 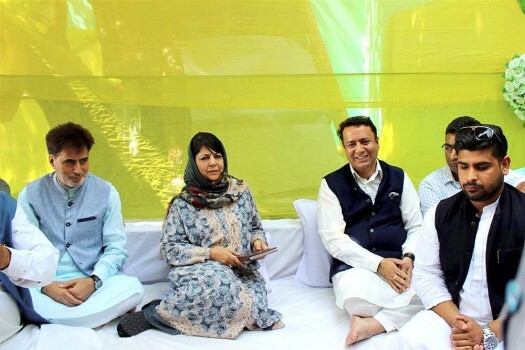 Jammu and Kashmir Chief Minister Mehbooba Mufti during a visit to Rajouri. 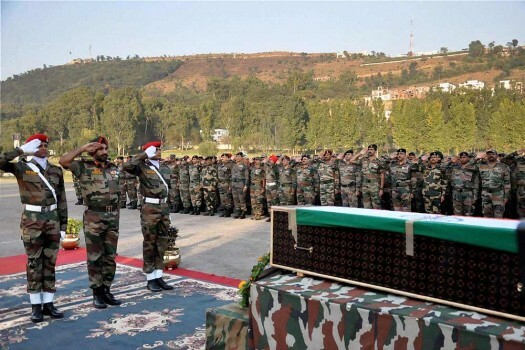 Army personnel paying tribute to soldier Bimal Tamang (inset) who was martyred at Line of Control (LoC) in Rajouri Sector, in Poonch district. 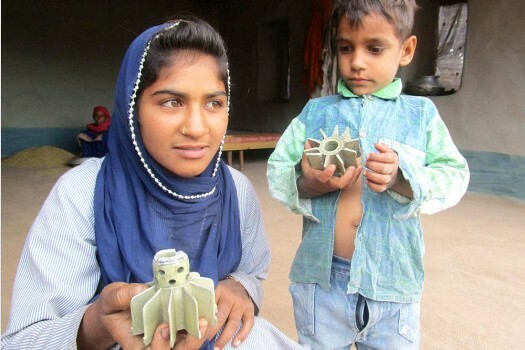 Children showing remains of mortar shells fired from across the LOC by Pakistan in village Panjgrain, Rajouri district, in Jammu. 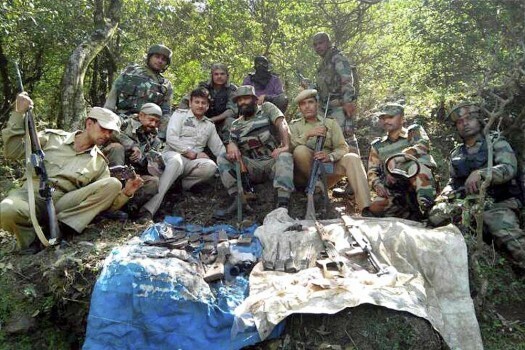 Army Jawans & Jammu Kashmir Police during a search operation after dozens of rusted grenades and bullets were recovered during excavation in Rajouri district of Jammu and Kashmir. Army personnel paying tribute to Sepoy Sudees Kumar who lost his life in firing by Pakistan, at a wreath laying ceremony, in Rajouri. The exams of classes V, VI and VII that were scheduled for today also stand cancelled, said Rajouri's District Magistrate (DM). 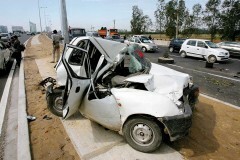 The fresh date of exams will be notified later. 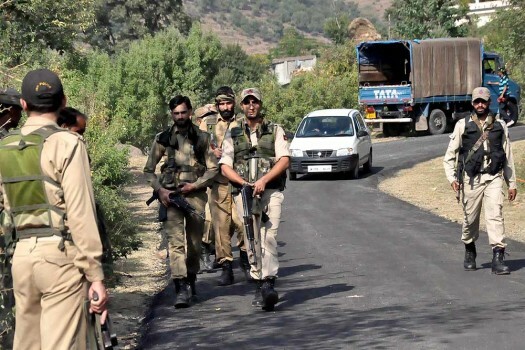 Authorities in Rajouri district ordered closure of all schools within 5km area of Lam, Keri, Pusharni and Peer Dadaser villages as the heavy firing and shelling continued. 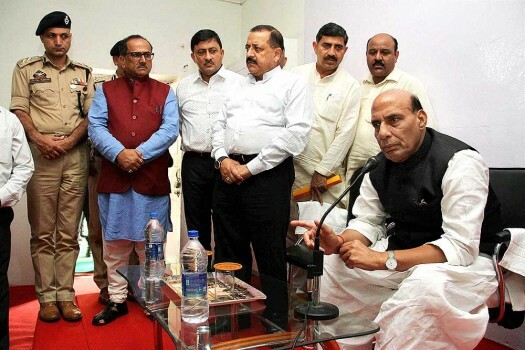 The incident comes a day after Pakistani Rangers killed four BSF personnel in Samba district of Jammu and Kashmir.